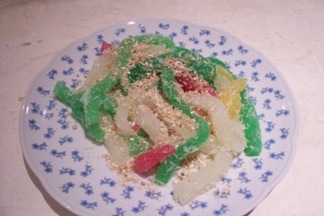 Rolls Tapioca Dessert or Cenil in Indonesian is very delicious dessert recipe for the day or in the evening after diner. It’s a warm welcome anytime. The sweet taste together with the seasoned grated coconut brings the taste more livelily. It's also very suitable for the children by making them with a few colors. They would love it. Mix the tapioca flour with sugar, vanilla sugar, and 1/2 teaspoon salt, blend it until well. Divide the mixture in 4 parts, one part remains uncolored, and the other parts colored with green, yellow and red. Boil water in a pan. Shape the dough into small, fat rolls, and drop them into the boiling water. Roll them in grated coconut that has been seasoned with salt and sugar. If you buy grated coconut from the Chinese supermarket, you will get dry grated coconut. That’s ok, you can use it. But you need to make them suitable to roll the dough. First put the grated coconut in a bowl that fit in a steamer. Add some water and salt in the coconut. Steam about ½ hour and you get moist grated coconut, ready to use.